Race has no place in a surgeon’s office. Or does it? 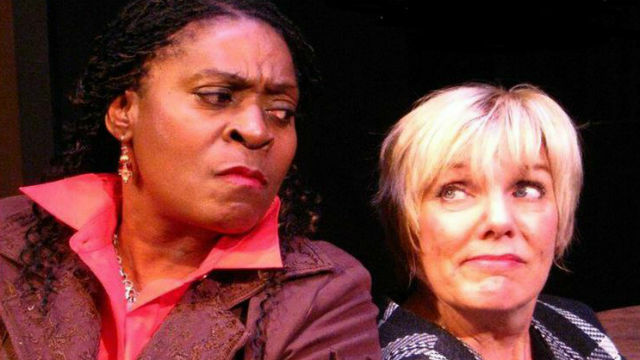 Joel Drake Johnson’s comic drama, “Rasheeda Speaking,” garnered an Outer Critics Circle Award for Outstanding New Play when it premiered Off Broadway last year. And plucky little Vantage Theatre scored the first production since. Directed by Vantage co-founders (and mates) Dori Salois and Robert Salerno, the provocative office politics piece stars Salois and Milena Phillips as work colleagues. Steve Oliver is just right as the doctor who employs them, though the script suggests that he’s supposed to be younger than they. He also has an awful lot of inappropriate and unprofessional physical contact (touching and hugging) with his employee. The white one, that is. And that’s only one of the less-than-believable aspects of the play. This, of course, dramatically changes the heretofore friendly relationship between Ileen and Jaclyn. One becomes compulsively suspicious; the other becomes defensive, then resentful, then vindictive. There are power plays all over the place, not to mention manipulations. It’s not a pretty picture but — despite its exaggerations and histrionics — it could be a somewhat accurate one. Phillips commands the show. There’s not a false move or moment in her performance, as Jaclyn hurls her lifetime of accumulated grievances at Ileen. As her cohort, Salois starts off a bit over the top, but settles in to a doggedness that devolves into borderline hysteria once the stakes get higher and the malice escalates. There could be more ambivalence in Ileen’s early relationship to Jaclyn. The vacillation is in the text, but it’s not always clear if Ileen’s expressed uncertainty or humanity is authentic. Vantage is inaugurating a new performance space, in an annex of the Congregational Church in downtown La Jolla. The bridge-chairs aren’t raked, but they’re staggered, which facilitates sightlines, and the small stage is elevated (the facility is reminiscent of Vantage’s former locale at the Swedenborgian Church Hall in University Heights). A new venue is always a welcome addition. Here’s hoping it hosts many more small-theater productions. There are only three more performances: Friday March 4 at 7 p.m., Saturday March 5 at 5 p.m. and Sunday March 6 at 5 p.m.